The College bakery. The daily task of feeding students and staff. Sir William Macdonald, founder of Macdonald CollegeSir William Macdonald may have donated large sums of money to McGill University, but he shunned the spotlight. James W. Robertson, who was the federal government’s commissioner of agriculture and dairying in the 1890s, was a flamboyant showman. Together, this odd couple created what is today known as McGill’s Macdonald Campus—and revolutionized agricultural education in Canada. 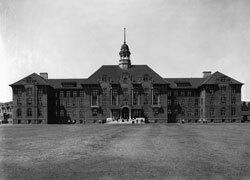 Macdonald College, located in the town of Ste-Anne-de-Bellevue at the western tip of Montreal island, would become that movement’s crowning achievement. Beginning in 1904, Sir William spent $1.5-million on 561 acres of farmland. When he opened a school on the land in 1907, he provided an additional $2-million endowment for operating costs. 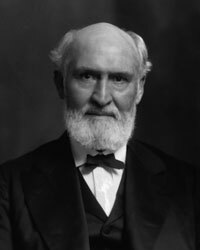 Robertson served as the college’s principal during its first three years and assembled a stellar team of professors, including cereal-breeding pioneer Leonard S. Klinck, who developed Pontiac barley and the Banner 44 variety of oats, and Frank C. Harrison, the agricultural bacteriologist behind a 1914 landmark study of Montreal’s milk supply. Mac researchers were productive right from the start, breeding new varieties of clover, alfalfa and soybeans. Macdonald College in 1908By 1929, with research on a roll, the academic leaders of Macdonald College turned their attention to radically reinventing agricultural education: All credits for applied courses were eliminated and classes focused on basic biological and physical sciences. The change brought Macdonald’s undergraduate programs new respect and served as a model for other agricultural institutions in Canada. By the late 1950s, there was little doubt that Macdonald was Canada’s pre-eminent agricultural college. It became the first Canadian school to graduate PhDs in agricultural subjects, and was home to nearly 20 per cent of undergraduates and almost 50 per cent of doctoral students studying agricultural science in Canada. By the time the Macdonald-Stewart Building opened in 1978, the campus was home to more than 1,000 students. Today, the Macdonald campus is home to the Faculty of Agricultural and Environmental Sciences, the School of Dietetics and Human Nutrition and many research centres. Some 1,100 undergraduate and 500 graduate students now study at Mac. Over its hundred-plus years, the sprawling campus has grown to include 1,600 acres of greenspace, classrooms, research labs, bike paths, an arboretum, a working farm, greenhouses and the state-of-the-art EcoResidence, an energy-efficient student dormitory created almost entirely out of recycled materials.